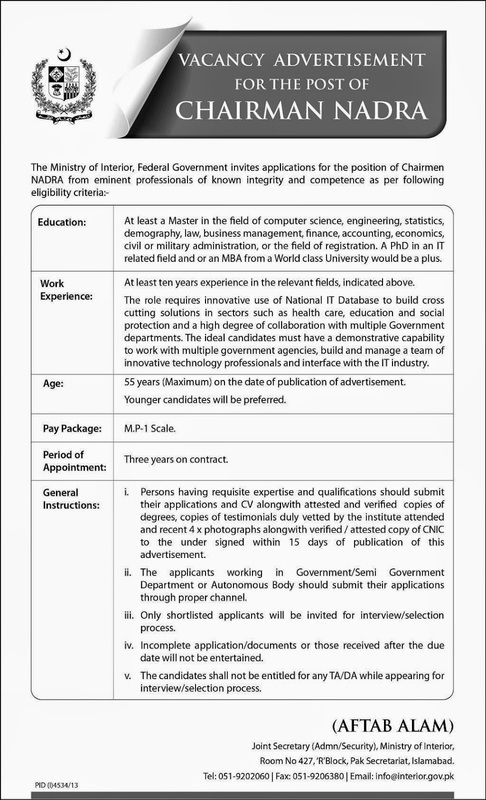 CHAIRMAN NADRA JOBS IN PAKISTAN ; The Ministry of federal Government invites applications for the position of chairman NADRA from professionals of known integrity and competence as per following eligibility criteria ; Education ; At least master in the field of computer sciencess engineering , statics demograhy , law business management, finance ,accounting , economics civil or militry administration , or the field of registration A phD in an it related field and or an MBA from a World class Universty would be a plus. Work Experience ; At least ten years experience in the relevant fields, indicated above . The role requires innovative use of national IT Detabase to build cross cuting Solutions in sectors such as health case , education and social protection and a high degree of collaboration with multiple Govarnament department the ideal candidates must have a demonstrative capability to work with multipule government agences , build and manage a team of innovation technology professional and interface with the IT industry .Age ; 55 years on the date of publication of advertisment younger candidates will be preferred .